SHELFIE | What Does SHELFIE Mean? SHELFIE means "Shelf Selfie". A SHELFIE is a photo taken to show off what is on someone's shelf. Typically, the person taking the photograph is also in the picture. SHELFIES are usually taken to show off books, figures, or collectable memorabilia. Many believe the term was coined by author Rick Riordan. SHELFIES probably came about as a result of the popularity of SELFIE. SHELFIE is a witticism based on SELFIE. The image shows a man taking a picture with a bookshelf. Person A: I color-coded my bookshelf. It's truly a work of art. Person B: Let's see it then. Take a SHELFIE. 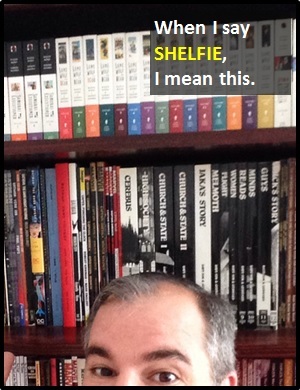 The term SHELFIE is an amalgam of the words "shelf" and "selfie."